One of the many summer jobs at Elmwood Stock Farm is making hay for the cattle and sheep to consume in winter months. It is of utmost importance that each and every animal have access to the nutrients they need to be healthy, each and every day. “Forage” is a collective term that includes grasses, like fescue, bluegrass, timothy, and orchardgrass; legumes, like red clover, alfalfa, and white clover; and forbs, which is a fancy name for weeds. We have to take each forage’s growth habits—warm season or cool season, annual or perennial—into account when we decide when to cut the plants for hay or to let the cattle graze it. We have pasture fields and hay fields and crop fields here at Elmwood Stock Farm. Some hay fields might get pastured but some pastures will never be hayed because the slope is too great or there are too many trees, for instance. We grow a lot of alfalfa, with a little bit of red clover and various perennial grasses mixed in. Alfalfa grows fast and tall, provides its own nitrogen, and has a deep taproot that breaks up the soil. We get three or four cuttings of hay from it each year. Just when the alfalfa starts to bloom, we cut it just a few inches above the ground, which stimulates it to send up new shoots. Thirty to 50 days later, it is ready to cut again. We hope to get dozens of rolls of hay off each acre every year. But the tricky part is getting that highly nutritious plant cut, cured and baled in a manner that preserves the nutrition. We need a three- or preferably four-day stretch with no rain to get it done well. The standing forage is cut with a disc mower, which has five rotating blades that cut the plants and lay the forage flat on the ground. Depending on how thick the stand was or the weather pattern at the time, an implement called a tedder may be pulled over the field. It lifts and flings the forage to fluff it up, allowing for better air flow and drying. Then a 20-foot-wide rake is pulled through the field, which sweeps all the hay into narrow windrows, making it easier for the baler to pick up and form the hay roll. There is a lot of nuance in managing the moisture level and keeping the nutrients intact in the hay. For example, rain leaches nutrients out of the leaves and can knock off valuable leaves from the stem. 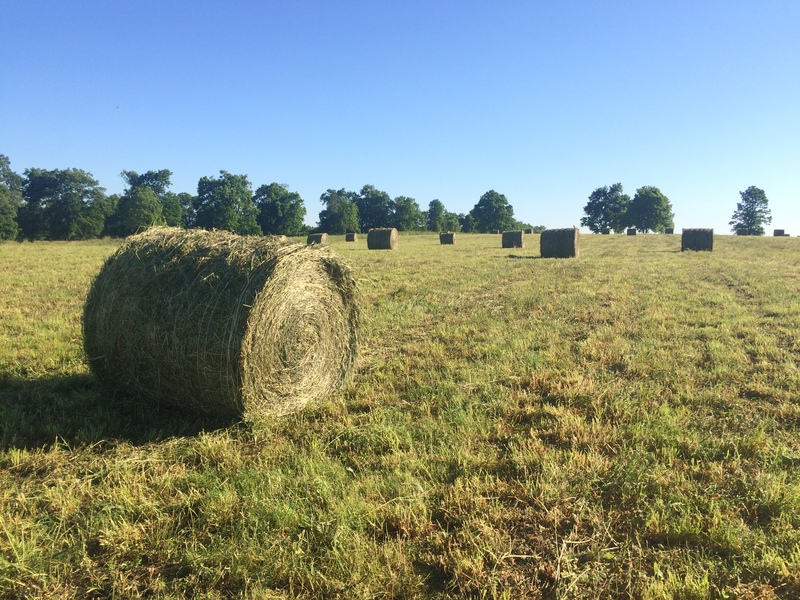 Recently cut hay will be less affected than almost-ready-to-bale, dry hay. Also, we fluff hay in the morning, while it is still a bit damp from the dew, because if the hay is too dry, the fluffing shatters those valuable leaves off the stem.